Lisa Ford has over 20 years of experience presenting to businesses, associations and government.As the creator of “How to Give Exceptional Customer Service,” the #1 selling training series, Lisa is best known for her work in the areas of customer service. Her other training resources include “Developing a Customer Retention Program” and “Building a Customer Driven Organization: The Manager’s Role and Personal Power.” She has also customized numerous training programs for clients to use in their ongoing education efforts. 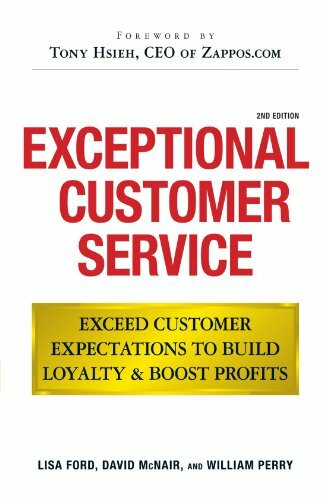 Her most popular book is Exceptional Customer Service: Exceed Customer Expectations to Build Loyalty and Boost Profits. Gail Davis: Today's guest on GDA Podcast is Lisa Ford. Lisa is creator of the best selling video training program, How To Give Exceptional Customer Service. She is also the co-author of the book Exceptional Customer [00:01:00] Service; Exceed Customer Expectations to Build Loyalty and Boost Profits. In her spare time she is a board member of The College of Arts and Sciences at the University of Tennessee and her client list is very impressive. Vizor, Viacom, Edward Jones, Kaiser Permanente ... whoa. Citco among many others. I've known Lisa for many years and it's my pleasure to invite her to be our guest on today's episode of GDA Podcast. Welcome Lisa. Lisa Ford: [00:01:30] Thank Gail and Kyle. I'm excited to be here. Kyle Davis: Well, it's a pleasure to have you on. Yep. Gail Davis: So Lisa, for as long as I can remember your name has been synonymous with customer service but what I don't know is how you became a thought leader in customer service. So, I'd love for you to share with us a little bit of your background or your back story with our listeners on how you got into this specialty. Lisa Ford: Well, it is a great specialty [00:02:00] because I have stuck with it for a lot of years. What happened is I was hired by a very small consulting firm many, many years ago and their specialty was customer service training. Not necessarily on the speaking side. The training side. One day, two day, training sessions primarily in the utility industry. So, water companies, electric companies, gas companies and we would go in and really just help the entire team [00:02:30] from frontline all the way up the ladder to the leadership on how to be more effective and again years ago people were happy to do one day and two day training sessions. As we know, those don't happen too much anymore. People want the small snippets but I worked for them for a number of years really embedded in the utility industry. Would even go out with believe it or not line crews, meter readers, sit in and listen on phone calls [00:03:00] so I could really get an idea of what it was like to serve that customer and worked for them and then decided to see if I could go out on my own as an independent, create my own client, build my client list and I just really chose to stay focused on that customer service and customer experience and customer culture. You know, we can add culture in front of, in back of a lot of words. We could put customer in front of a lot. Anything I [00:03:30] do though really has to do with the customer. So, I've really stuck with my roots after all these years. Gail Davis: So, I am hearing this term, customer experience a lot more. What's the distinction between traditional customer service and customer experience? Lisa Ford: Look, customer experience I believe is what will cause your customer to talk about you. To create the buzz and enthusiasm [00:04:00] about you and then become a loyal customer. Customer service is more the basics. The foundation and that's got to be there but if we don't have the foundation of customer service I don't think we've even earned the right to move onto customer experience, but the customer experience is what's memorable and that's the goal in today's time. Kyle Davis: So, to help, you know I have a pretty strong understanding of [00:04:30] customer experience because I used to work for a few tech companies where it's usually important. We actually sold a platform that was a CX platform. Kyle Davis: So, I have an understanding of this but for those people who kind of have an understanding of customer service being the department that you call into, how do we get past like NPS or net promoter scores and the email surveys or the post call surveys and how do we start delivering really good customer experience or how do we create [00:05:00] these good customer experiences so that they do become loyal beyond the you know hey I'm helping you now? Lisa Ford: Well, I think the most important thing is you've got to have the right leadership preaching it. You've got to have the right customer champion that just keeps it on the agenda. So, yes we've got to have people there picking up a telephone, figuring out what we need to be doing on our chat box. Whatever it may be but then I've got to truly have that leader [00:05:30] that says, this is what we're going to focus on and keep it on the meeting agenda. Keep it on team meetings because otherwise I think we then start to chase the next shiny object within that corporation. So, yes, somebody's going to answer the phone but then how does that person not only serve the customer as the customer needs at that moment but then creates an opportunity to deliver an experience, and [00:06:00] that might be simply through a followup with that customer. It might be an offer to do something that's above and beyond. Customer experience may be an app that you put out there in the marketplace that people are just blown away by, that something fun, interesting, creative, but it starts to brand you in that customer experience field. So, those kinds of things have to be in place but I think it all starts with the leadership and [00:06:30] that's where it sometimes then disappears because again they get caught up with what's next and it doesn't always focus on the customer. Kyle Davis: So once you get, so like my mom and I were having this discussion prior to going to record and we're talking about design and like the importance of design and one of the things that became very clear to me when it was a customer centric company that really thought about customer experience is that they designed what that looks like [00:07:00] from pre-marketing to initial talks to acquisition to nurture to growth to end of life cycle to off boarding. I mean from beginning to end the entire customer service and customer experience was laid out and I know you're talking about it starts at the top but how do you find these leaders, these visionaries that can really help this shifting so it's not your jumping from a new platform but instead holistically addressing the customer experience or customer service [00:07:30] problems and demands that the market needs today? Lisa Ford: Well, first off Kyle I wished more people were doing exactly what you just listed out, that entire life cycle of designing that customer experience. Most are not. They're behind the eight ball. They're attempting to catch up at this point. Where do you find the people? I think in most cases you simply have to make certain you've got someone on board who realizes the customer truly [00:08:00] is the life blood of your organization. Now that sounds like that should be a no brainer but again we get too focused sometimes on share holders' needs, owners' needs, pricing, cutting prices and we take our eye off of that customer experience. So, I think we've got to have somebody who as I mentioned earlier is a customer champion and in some situations that customer champion needs to just take a leap of faith that if [00:08:30] we design a customer experience from front to end and employee the right software, buy the right data, marry the right data together then it will pay off on our bottom line in the long run but as you well know and Kyle based on your experience, a lot of people have not put in some of the metrics to say it does pay off on the bottom line and it will make us more profitable. So, sometimes it is simply [00:09:00] a leap of faith to make it happen. Kyle Davis: Yeah, I think, when I had a lot of conversations you know there's people who get it but I would say to your point of what you said earlier was that there's a lot of people who just think customer service is simply being hyper responsive to emails, picking up the phones, but they don't really think how the whole experience is. Kyle Davis: You know, something as simple as simplifying your website or simplifying a lead and this is coming from a person who focused more on the sales side, that simplifying a lead form [00:09:30] improves your customer experience because it lowers the amount of touch points. It lowers the amount of stress. It limits the amount of options. It empowers the customer. It makes it easy and it's designed from beginning to end. How do you get people then, my guess is when we're going from this kind of antiquated culture of thinking it's just enough to pick up the phone or respond to an email to really taking a really deep dive into all aspects of someone's business. Lisa Ford: Uh-huh (affirmative). Well, you're very familiar with what [00:10:00] some organizations are starting to do and again it surprises me when I find out many have not but it's the old journey mapping and is anybody doing enough of it and once we've done it do we think we've done it? I think we need to revisit that concept on a regular basis because things such as your journey map will show you concretely where things are going wrong. Like, with the website what's slowing you down? What's falling apart? What's getting [00:10:30] lost in the process? It also shows you where the gaps are and those gaps may cause your customer to not proceed to the next step and then we lose that customer because we know and you just inferred it with your comments, Kyle that the more effort the customer has to go to then the greater chance for disloyalty. Lisa Ford: Any increased effort, any amount of work that [00:11:00] they've got to do to solve their own problem, to get an answer from you, to deal with your website, that will help drive disloyalty. So, again we've got to get folks on board who are willing to do that hard work and see that customer service is more than just picking up the phone and how every piece of that organization and every person and every team is really a part of that entire picture and that really [00:11:30] kind of again goes back to some of the leadership. It goes to the culture that we're speaking of. Gail Davis: You know you said early on that you've really always focused on customer service and I'm curious, as you you know moved away from your you know, original industry and went broad does it cross all sectors or do you customize customer service and customer experience depending on what industry you're in or are the fundamental [00:12:00] basics universal? Lisa Ford: The fundamental basics are universal. I wish I could say oh no, no they're not but they really are. So, we've got to have those fundamentals across all those industries. Then, yes, customize accordingly because some of these, some companies, some clients are much more sophisticated in how they're dealing with their clients and how they're clients are coming to them. So, the customization comes in [00:12:30] with how is that customer dealing with this particular client and then what pieces of customer experience, customer service needs to be focused on. I mean, I even do a lot of kind of the internal customer service piece. You know, how do people behind the scenes that really are not customer facing at all, what are they doing to ultimately serve the client even though they don't see themselves as doing just that? [00:13:00] So, you know, everybody is a part of it but only some of the most enlightened organizations truly get it and don't just give lip service to it. They stay, they keep it on the agenda, they stay on track and focus on making that organization truly you, customer centric. Kyle Davis: So, one of the great benefits I have for working, for working, I worked at Square and when I was working there one of the mandated requirements that we had was to shadow other departments and it was, one of the most mandated [00:13:30] was you have to you know go to the customer service side. Like, no matter what. Or like the call side. I forgot. They had a name. Everything was a pun on a square but so you had to go over there and what it allowed for was like the engineers could hear the problems of, not engineers more the designers could hear the problems of, oh this is taking six clicks or presses of something? Let's limit it to three or two and then [00:14:00] what it does is it then decreases the amount of pressure that's put upon your customer service department because you're improving the overall journey and you're mapping it correctly but it also creates a more empathetic kind of environment where people really think about you know, what is the next release going to be and how is it going to, and this is more from software but the same is true in other industries. Lisa Ford: Yeah, that job shadowing really helps people [00:14:30] answer this question, are you thinking like a customer? You know, are you really experiencing what our customer experiences and you're right, that engineer, that software tech, that dispatcher, you know let's go even more basic, that dispatcher, the manager of a retail store, the front desk manager of a hotel desk. I mean, they start to really get it because they're doing that job shadowing and they start to see things [00:15:00] much differently. You know, the help desk within organizations. People who send out the invoices, the accounting department, HR, you know all those teams need to have that opportunity to sit down, listen in on phone calls and get the clue or you know sit in with somebody who's dealing with the social media, somebody who's just sitting there answering that, somebody who's doing the online chat. You know, we've got to have more hands on it, more eyes on it so that they can improve that process. Kyle Davis: To [00:15:30] that point and I just want to put an end cap on this is like everybody in the company did it. It wasn't just something that was mandated to middle to lower tier. I mean it went all the way to the top, to the CEO would go and take customer service calls himself. I mean it was like, I think every Tuesday he would do it and it was just hilarious. It was like funny to us but like it helped better you know, better, have a better understanding of the customer's needs and wants and then really to improve the overall product and experience. Lisa Ford: [00:16:00] Then that just speaks on what we started our conversation with. It's the leadership that really makes this different and you know when the people see the leader doing it guess what, they get on board a heck of a lot faster. Gail Davis: So, I was wondering if you could identify the number one reason that you feel customer service is not delivered? Lisa Ford: Oh, gosh. I think it does start with the leadership and I think in many cases they are [00:16:30] not looking at the entire picture as well as some of the stupid stuff. Gosh, doesn't that sound quite intelligent? The stupid stuff that they are asking their people to do and what I mean by that is I just called a company two days ago. This company's been in the news a whole lot lately and the poor individual that answered my phone, [00:17:00] answered my phone call was so scripted that it only added to my frustration and the scripted answer did not answer my question. So, there was no empathy but this is what the poor individual had been asked to do and it's hard then to even get upset but this was all that was being expected of that individual. So, you know everything from the stupid stuff of scripts [00:17:30] and how we're making it too complicated in our processes and our procedures and then some of the gaps, we just aren't looking at it you know closely enough. Again, I just don't think somebody's giving it enough attention because you know customers, we know more of what customers want today. I mean, they want you to be where they are. They want you to meet them where they are. Whether that's an app, whatever channel it is, they're choosing to interact [00:18:00] with your organization they want to be met there. So, today's customers they're choosing the channel, they want self serve and they want self service that will you know, save them time, answer questions but they also want you to anticipate their needs. Gail Davis: So, if a listener is recognizing some of those things, like maybe they are expecting their staff to do stupid stuff or you know, they're not really as engaged with the customer as they need to be, [00:19:00] what are some of the first things you do to try to turn that around? Lisa Ford: Well, I think the first thing you do is you're hiring smart to start. Now, some people say well it's too late for that. You know, we didn't hire smart to start, now we have this group of people and at that point what are you doing to train and coach people to get them back on board with you. So, again, we've got to have a strong team, team leader, [00:19:30] vice president of customer experience. Someone that is saying, okay we've got to retrofit people with our thinking around service and experience and culture and in those opportunities, when you're one on one with your team members, in possibly a ten minute huddle, are we telling the right stories? Are getting people excited again about who we are [00:20:00] and the potential we have to serve the customers and create memorable experiences? So, how do we get them on board is we hire well, we train well but to truly engage those employees in today's time and you all know this, those team members have to feel that there's a purpose that they're walking in the door every single day. So, as that leader, as that manager are you talking purpose? Are you reminding people why we exist? Are you then keeping [00:20:30] that on the agenda and then how do you help people feel connected to that purpose? You've got to go beyond their 17 square feet. That's why I love the job shadowing, Kyle. Kyle Davis: uh-huh (affirmative). You know, well one of the things that I like about job shadowing too is that you know, I think too often and a lot of more, and I say legacy, legacy companies is that a manager never does the role of the people that they manage or leadership never really does that role and so then they wonder, [00:21:00] if, and I'm of the belief that design and all these things that we've talked about those are hugely important but at the end of the day your customer service is brought to you by the team that you have and if you don't know what their day is like or how they work or what programs and just the fact that there's been no oversight in process and procedure in however long and it's the most redundant and complicated system, they're never going to be able to provide that exceptional customer service if you haven't walked [00:21:30] a day in their shoes, or a week, or a month or really took a deep dive into what it is that they do on a day to day basis. Lisa Ford: Uh-huh (affirmative). That's right. Yeah, you don't really get a clue that if your organization, your processes, your procedures are really driving a great customer experience. So, you've got to get there, you've got to get hands on to see what you're putting your people through. I think in many cases we've really tied their hands. We preach it and we say this is what you should be doing but we still will have tied their hands and they're really not able [00:22:00] to do what you're asking of them and so that's why I think it's real important to do much of what we've talked about but also sit down with your team and figure out, how can we get them to feel more connected? How do we give them opportunities to get excited about the brand of customer experience? Give them examples of what customer experience looks like. I think in some cases we have kept them a bit bound by processes and systems that are not customer [00:22:30] focused and they don't even know what is being asked of them. You can stand in front of them and say gosh let's create these customer' experiences. What does that look like? What are you asking me to do and then if I do do it am I really going to be allowed to do it? That sounds like a little bit outside the boundaries that I've ever you know, thought about. So, you know we've got to really think through that as an organization if we're going to engage our employees and as you all well know if I don't have an engaged [00:23:00] employee I'm certainly not going to ask them or expect them to be able to engage our customer. Kyle Davis: So, I think you said something that I think was really important and it was, do they have the ability to do something? Do they have the autonomy to be able to act with asking for permission, maybe to ask for forgiveness later? Kyle Davis: So, how does one cultivate a culture like that? I mean, some of the best organizations I've worked with it's ask for forgiveness [00:23:30] later. It's never ask for permission first. Lisa Ford: Right. Well, we've got good examples of it. People like Zappos, Ritz Carlton, you know they are allowing people to go ahead, act but I think how they do it is because at team meetings they are constantly reminding people, this is who we are and they give people examples of what empowerment looks like and I think that's what you've got to do. You've got to help people see, oh if I [00:24:00] do that then it's okay and again if you've hired well and you've trained well then you create a few boundaries and then say now, act, think, behave on behalf of the customer and our organization to do what it takes to serve this customer. Kyle Davis: I do want to be very clear. I'm not saying carte blanche be able to do whatever you want. Kyle Davis: Obviously, there has to be specified boundaries. Lisa Ford: Well, and that's why I said within these boundaries, act, [00:24:30] think, behave, make decisions on behalf of the customer and our company. Gail Davis: I have a new example for you if you haven't heard it. Gail Davis: I was just with Kendra Scott. So, I don't know if she's that popular in Atlanta but everyone you know from Texas, she's from Austin. Everyone knows her jewelry and she was sharing this very simple direction that she gives all of the gals that work in her stores. Gail Davis: Treat the customer, do [00:25:00] for the customer what you would do for your sister. So, if your sister walked in here and said this is my favorite pair of earrings and I lost one, would you make her buy a whole new pair or would you help her out and give her the other pair for half price? You know? Just treat them, do for her what you would do for your sister and I was with a bunch of entrepreneurs and they were like, God that's just so simple. In that environment for that particular product, you know? Lisa Ford: I know. Yeah, that's exactly right. I think what you've to get your team at all levels, all [00:25:30] departments to really own that customer experience and then how you do it is I think you've just got to keep it on the agenda. You talk about it. You have huddles. I mean again you all are very familiar with what Ritz Carlton does with their 15 minute daily meeting. It's their daily lineup and they do it every single day, every department, every person, 15 minutes and in those 15 minutes they talk about corporate goals and issues. They talk about that hotel's specific issues as well as that department [00:26:00] but it gives them a chance to also tell stories about great experiences and they don't not do it. It's every day. That's how you make this stuff happen. It's got to be so embedded in the culture that then people get it, that I'm going to own that experience. You have housekeepers who see those rooms as my room. You know and Gail to your point you know if your mother was coming [00:26:30] to stay in this room tonight how would you make it look this evening? So, yeah. Kyle Davis: Yeah, I'm a huge fan of like the stand ups or huddles or you know the 15 minute meetings. The way that they've always been organized in the companies that I've worked for is like a little bit of something called yesterday today. So, this is what I did yesterday. This is what I'm doing today but the focus is always geared towards these like quarterly goals that are broken down then by month that are then broken down by week that every [00:27:00] single bit of the way it's all customer centric and customer focused and if and then there's a third thing. Yesterday, today, and then blockers and so your blockers would be like I have an issue with this and then this is where management comes in and helps you assist whatever the customer's needs are to get, overcome that blocker whether it's an onboarding or in a sales capacity or if it's just through account management, there's some sort of blocker that as a team you can kind of work through to provide that excellent customer experience. Lisa Ford: [00:27:30] Yeah, excellent and I love that. Great value to your listeners. You know, how you create that kind of meeting, asking those questions? A couple that I always ask is you know, what's now? You know, what do we need to do now and that's basically to improve performance, improve our service. It may be if I had a sales team to meet those quarterly goals and then what's next and then next is the transformation and what am I going to do not only now but [00:28:00] have in my mind how do I truly do something that is memorable and you know, I've got to act as if every customer I'm serving has ten thousand Twitter followers and you know so I've got to serve them in a way that blows them away just in case they did really have ten thousand Twitter followers. Who knows? Gail Davis: That's a great modern day reference point. I love that. Gail Davis: Treat every customer like they have ten [00:28:30] thousand Twitter followers. Kyle Davis: Oh, the power of influencers. Gail Davis: Yeah. That's awesome. Lisa Ford: Yeah. That's right and again it really kind of helps us think more, you know what's the customer going through with us at that moment and you know, today's customers want to be known. I think we've got to know our customer but really show we know them and that has to do again with leadership decisions on the data that we are marrying from department to department [00:29:00] and again Kyle you've worked with some innovative companies but we still have lots of companies out there that that data is not married from department to department to department. We still have the silos. You know? Lisa Ford: Sales has their stuff and service has their stuff and engineering and technology you know, and it's not making sense anymore because today's customers except regardless of what channel they have entered in [00:29:30] that you know everything about them. Kyle Davis: That brings me to a really great point. I mean, every company that I've worked for is really customer centric focused. I had access to every bit of data, even though it wasn't in my purview for the job that I had and so that was, I could see when they paid a bill because you know what, as the sales person I may be the point of contact that is saved in their phone. They don't have the accounting department phone number. So, I have to be able to see oh was it paid on time and that's, I'm not doing my job. I, in the old way of doing this I would [00:30:00] just hit the forward button and forward someone to accounting, but I had access to every bit of information ... go ahead. Lisa Ford: That's so unusual. Kyle Davis: It sounds unusual but I think the focus for these companies that I've worked for was really providing outstanding customer service and customer experience and we just had a really robust CRM system and everybody took copious amounts of contemporaneous notes and it was very easy to plug in and share and like, boom. I mean, when was the last time you talked [00:30:30] to this person? The information is there. Nothing is secret, nothing is hidden and a lot of trust was given to us but it was given to us because of the importance of providing a huge network of just stellar, stellar clients and to that point too, one other thing is that we always had, at Square we had something called Hero Merchants and these are merchants, big or small, it might be a doughnut shop to a major you know retailer. Kyle Davis: They would come in and they would be very [00:31:00] frank. What do they like and what do they don't like and they would say it right in front of the company and this is in front of Jack Dorsey, you know, [inaudible 00:31:08] and all these other, and they would say here is what we like. Here's what we don't like and some of those vocal people were the small business owners but they had the most to lose and they, they're stuff got implemented the soonest because they said here are our problems and so we focused on fixing and remedying this. Lisa Ford: That's great and even with customers [00:31:30] that are being, you know, trying to serve themselves because again many of those that's their need today. They want self service but that self service has to be personalized and it has to be really smart, sophisticated, intelligent so that that customer realizes gosh, you know me. So it doesn't even require a real voice but we've got to have all that data you know married, again I just, it's a simple word, so that we get that full view of [00:32:00] that customer and I will tell you, if you do have a chance to really talk to the customer in today's time it's a rarity because in many cases they don't want to really talk to a real person. So if you have a chance to talk to them you'd better be incredibly good because you finally have a chance to take advantage of that contact. So, that's when it's above and beyond and you don't do the stupid stuff like park somebody scripted [00:32:30] in a response. Gail Davis: I'm curious Lisa if there are any variances or variables when it comes to customer service if you have a product versus customer service if you provide a service? Lisa Ford: I, there's not a lot. I wish I could say oh yes here is exactly what it is but the service in most cases is going to be a little more on the relationship building side. Where [00:33:00] the product, people are going to have more connection with the actual product itself to start. Then we work more on the relationship side. Where if it's just a service I'm providing it's pretty much all a relationship. So that's going to be more conversation, more trying to figure out how often they want to hear from us, you know how much outbound proactive contact do we [00:33:30] initiate versus the product. That's usually why we're being sought out to start would be a specific product but I will tell you, with both in many cases they're both commodities and given that it's a commodity you all well know, if there's no difference, there's no value, there's no relevance then price becomes the only issue. Whether it's a product or whether it's an accounting service or you know [00:34:00] whether it's an consulting service. So, we've got to make certain we're creating the experience regardless, whether it's a product or a service. Lisa Ford: I know you can Kyle and that's what makes these podcasts so wonderful. Gail Davis: We can have Lisa back sometimes. Kyle Davis: Yes we can, but I will say this. When it comes to a low touch kind of acquisition [00:34:30] customer lifestyle you made a brilliant point and I'm not going to give too much away because I have like to charge my consulting fees for this. So, if anybody wants to do that they can come to me but ... or you, but me. So, but anyways when it comes to the importance of how you acquire your data but more importantly how you then take that data to them get in front of the customer. You brought up a brilliant point of what's the frequency with which you contact them, when do you contact them, [00:35:00] and what I find is just hugely brilliant whether it be, let's just use an innocuous one. You brought up like a CPA or an accountant. Kyle Davis: You know, when do you really start reaching out to your clients? Kyle Davis: So, you know, how do you use that customer data to find out when do you start getting these people into your door, when do you start your outreach for the nex tax season, etc, etc, and if it's a use based product can you watch their use and see if it's going [00:35:30] down? Maybe it's time that you get in there and say, hey, what's going on? Do you have a problem with it? So you can get that use back up to normal rates. Lisa Ford: Uh-huh (affirmative). Yeah and then I've got to make certain that contact that I have scheduled in doesn't come across as robotic. Lisa Ford: Because I think then it can. It's like, oh, they're just calling me to say we need to go over my financials, let's say it's a financial advisor, because they've got to do that every four months. Well, that doesn't add a lot of value. It doesn't [00:36:00] feel real to me. It's got to be sincere. It's got to be real. It's got to be relevant and then it truly adds value to that experience. Kyle Davis: Awesome. I think that is a good place for us to wrap. If not we'll going all day. So, with that being said if you would like to book Lisa Ford for your next event you can do so by contacting the excellent customer experience team at GDA Speakers. The number is 214-420-1999. The website's Gdaspeakers.com. For [00:36:30] the transcript, books, other stuff like that of today's podcast and others you can go to Gdapodcast.com. With that being said, thanks Lisa. Gail Davis: Thank you Lisa. Lisa Ford: Oh, thank you all. You're so much fun to be with. Thanks.